Athletes at Murrieta Valley High School signed national letters of intent Wednesday. 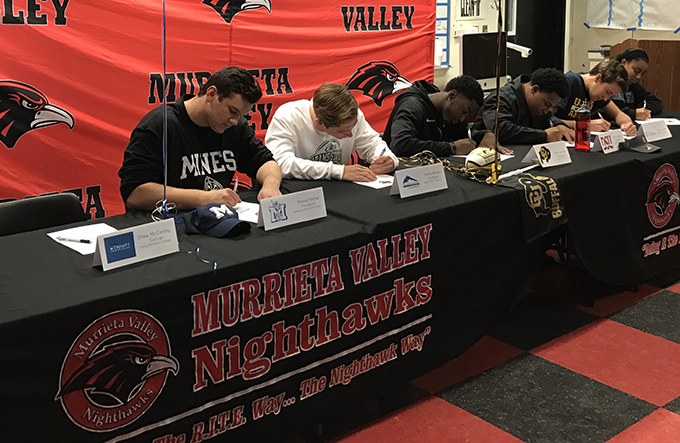 Eleven standout student-athletes at Murrieta Valley High School signed national letters of intent this week, accepting college scholarships. The honorees, recognized during a ceremony at school on Wednesday, includes four members of the Nighthawks' football team, which advanced to the CIF Southern Section finals last fall. Olita Palmer rushed for 2,472 yards and 30 touchdowns last season. He signed a letter of intent with Dixie State University. Teammate Maurice Bell signed with Colorado. He caught 69 passes for 1,083 yards and 7 touchdowns in 2016. The other football players making their commitments official this week were defensive end Kane Bowen (Adams State) and tackle Tanoa Fedler (Colorado School of Mines). Soccer players who committed were Drew McCarthy (Trinity Christian College) and Caitlin Rogers (University of Montana). In addition, five water polo players signed -- four of them with UC Irvine. They are Christina Reyes, Megan Falcon, Morgan Jones and Casey Lynton. Randi Reindardt signed with USC.